Listed below are rules to follow when using algorithmic volume and/or localized delta divergences to support your decisions. It is obvious that discretion may be applied to any of these, but in general it is advisable that they be followed. These are only basic rules and more specific advice is available to subscribers, including a 30 min one-on-one consultation. 1) Do NOT enter a long position near a local low BELOW a price which had a positive algorithmic bid volume. Similarly, do NOT enter a long position near a local low BELOW a price where localized short delta divergence occurred (red dot on the price/delta graph). 2) Do NOT enter a short position near a local high ABOVE a price which had a positive algorithmic ask volume. 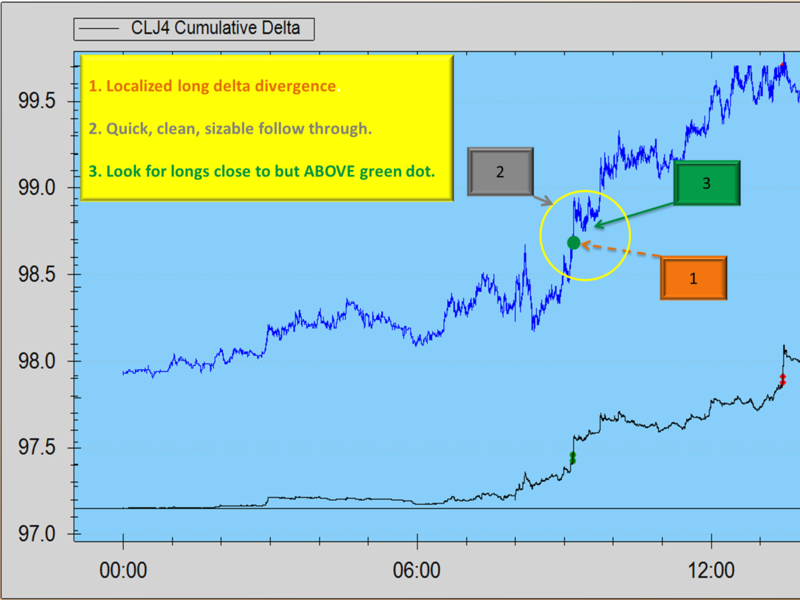 Similarly, do NOT enter a short position near a local high ABOVE a price where localized long delta divergence occurred (green dot on the price/delta graph). 3) To fade a down move, look for a failure to follow through of a localized short delta divergence (red dot) and/or algorithmic bid volume at a price (yellow box) and, ideally, a quick and sizable reaction in opposite direction (price going up from a local low). Wait for a retrace close to but ABOVE red dot/yellow box. 4) To fade an up move, look for a failure to follow through of a localized long delta divergence (green dot) and/or algorithmic ask volume at a price (yellow box) and, ideally, a quick and sizable reaction in opposite direction (price going down from a local low). Wait for a retrace close to but BELOW red dot/yellow box. 1) Do NOT enter a long position near a local high BELOW a price which had a positive algorithmic ask volume. Similarly, do NOT enter a long position near a local high BELOW a price where localized long delta divergence occurred (green dot on the price/delta graph). 2) Do NOT enter a short position near a local low ABOVE a price which had a positive algorithmic bid volume. 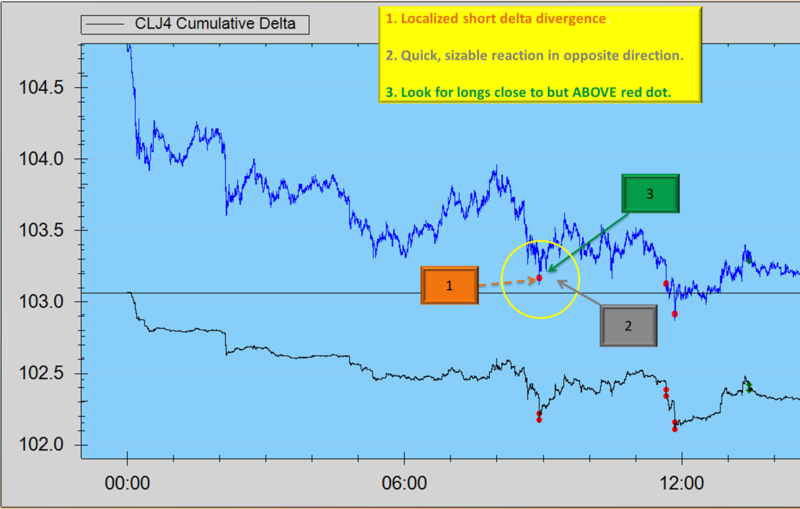 Similarly, do NOT enter a short position near a local low ABOVE a price where localized short delta divergence occurred (red dot on the price/delta graph). 3) To follow an up move, ideally look for a quick and sizable follow through of a localized long delta divergence (green dot) and/or algorithmic ask volume at a price (yellow box). Wait for a retrace close to but ABOVE green dot/yellow box. 4) To follow a down move, ideally look for a quick and sizable follow through of a localized short delta divergence (red dot) and/or algorithmic bid volume at a price (yellow box). Wait for a retrace close to but BELOW red dot/yellow box. The above rules 1 and 2 of ‘Reversal/Continuation’ are to rule out ‘Continuation/Reversal’ first. Rules 3 and 4 then specify how one might look for a setup in each case. Let’s discuss some of the above using examples for crude oil contract. In all the pictures below the displayed time (horizontal axis) is Central Standard US Time. The first picture is for March 18th, 2014 crude oil contract CLJ4. Continuation’s rule 3 applies here. Picture 2 zooms in-using our volume at price chart-to provide further clues on the ‘strength’ of this setup. 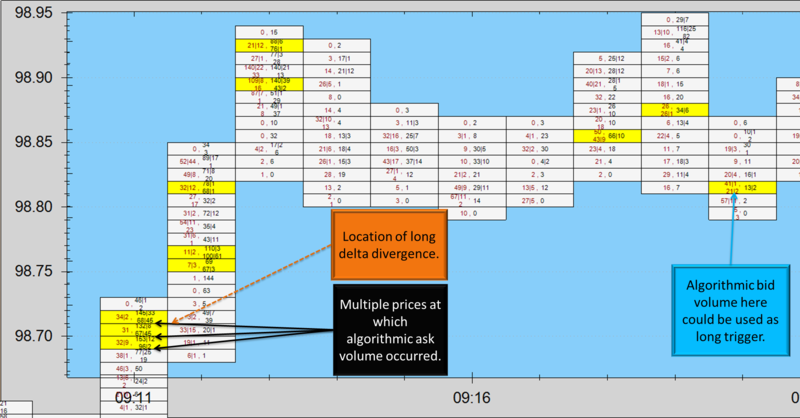 Here we see multiple price levels with algorithmic ask volume in the area of localized long delta divergence. This fact alone – along with subsequent price action (substantial follow through) – would be a basis to look for a continuation long setup on a first retrace close to but ABOVE that area (using Continuation’s rule 3). Picture 3 is for March 4th, 2014 crude oil contract CLJ4. Reversal’s rule 3 applies here. 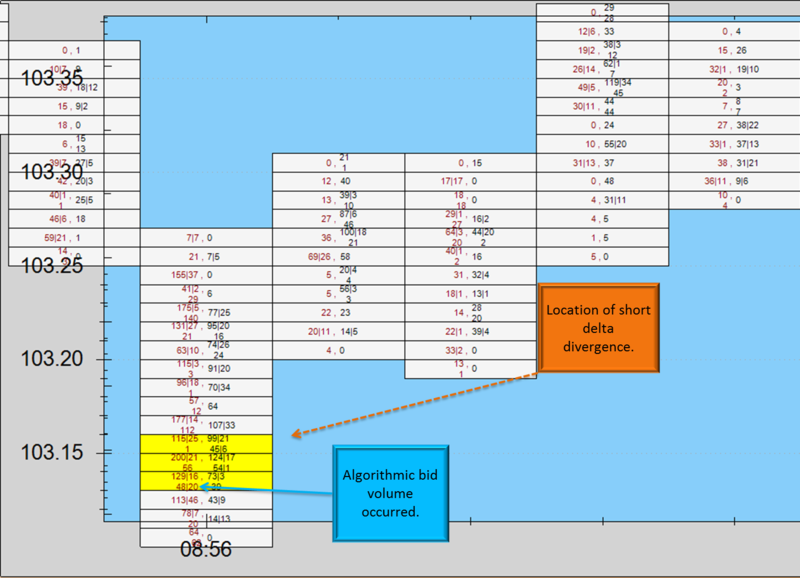 Zooming in to the volume at price chart picture 4 we find further supporting evidence for this long reversal setup-algorithmic bid volume in the area of localized short delta divergence. Disclaimer: The above is not intended as advice to execute any trades and is intended for educational purposes on how to generally interpret various outputs of our software. TERMS AND CONDITIONS apply. Available for all futures on all exchanges. Contact us about other platforms. Our software runs on windows operating systems (Microsoft Windows XP or higher).